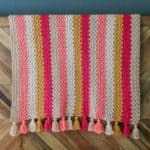 Modern Gender Neutral Crochet Baby Blanket - Free Pattern! 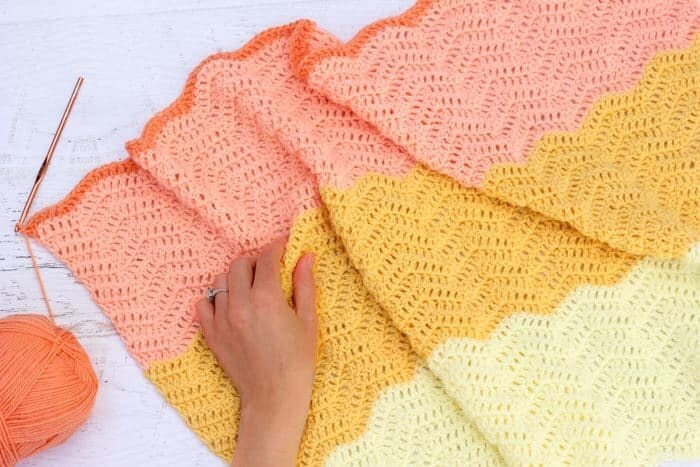 Put a modern twist on the traditional ripple afghan with this gender neutral crochet baby blanket pattern! The free crochet pattern is below or you can purchase the ad-free, printable PDF for $2.75 here. 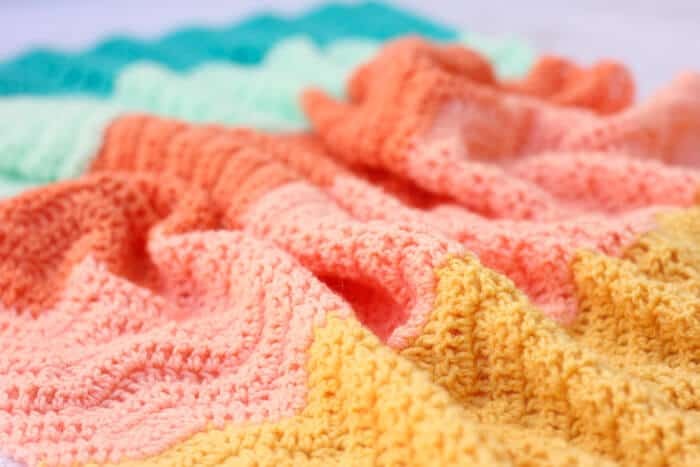 This crochet baby blanket post is a collaboration with my friends at Lion Brand Yarn. This post contains affiliate links. Truth: As an infant, my oldest daughter slept about as well as an owl on Red Bull. Truth: My oldest daughter still sleeps about as well as an owl on Red Bull. Truth: While trying to coerce her to sleep in those early months, I used to play a children’s song for her called “Welcome to this World” on repeat while I sobbed and wiped my nose on her receiving blankets. This motherhood thing is quite the glamorous gig. The thing that got me every single time about this song (besides just the complete stew of hormones I was marinating in) was the concept of welcoming a completely new human into the world and the gravity, responsibility and hope that comes along with it. I named this gender-neutral crochet baby blanket the “Warm Welcome Blanket” because I think that making things with your hands is one of the most productive and rewarding ways to prepare for welcoming a new life into the world. What says, “We all wanted you. We were excited to meet you. We loved you even before we knew how cute you were going to be,” more than a crochet baby blanket that was lovingly stitched row after row? I can’t think of anything! 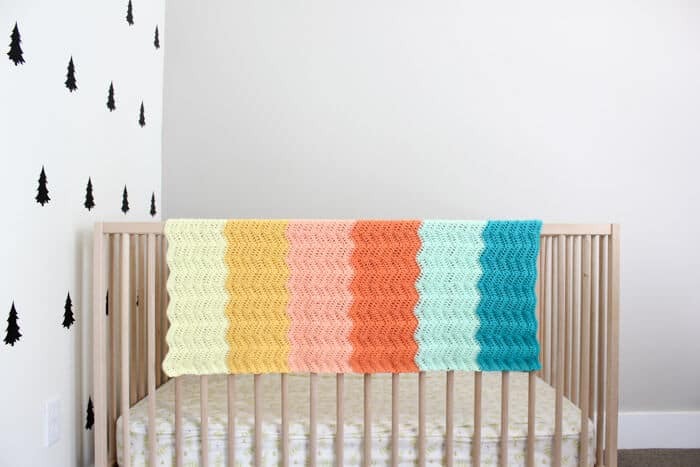 I think this gender neutral crochet baby blanket makes the perfect pop of color in a modern nursery. (Isn’t this little bunny just the cutest? My mom made it for my daughter using this free pattern.) If you like modern nurseries with DIY touches, check out this collection of DIY Modern Nursery Decor Ideas I put together. You can also see all my free crochet baby blanket patterns here! Thanks to Lion Brand Yarn for sponsoring this pattern and enabling more free patterns on Make and Do Crew! 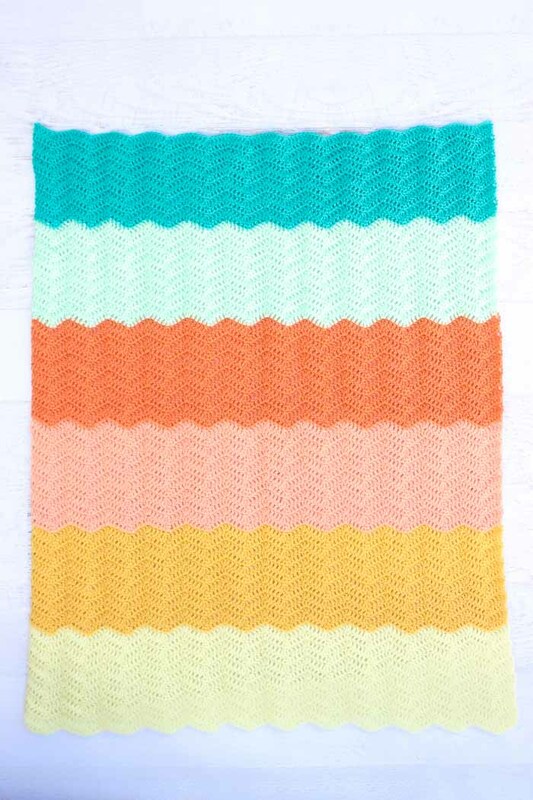 The Baby Soft yarn I used for this crochet baby blanket is on sale for the entire month of May on LionBrand.com, so now is a great time to grab your yarn in all these gorgeous colors! You can even purchase a “Warm Welcome Blanket” kit here. • You can easily adjust the width of this blanket. 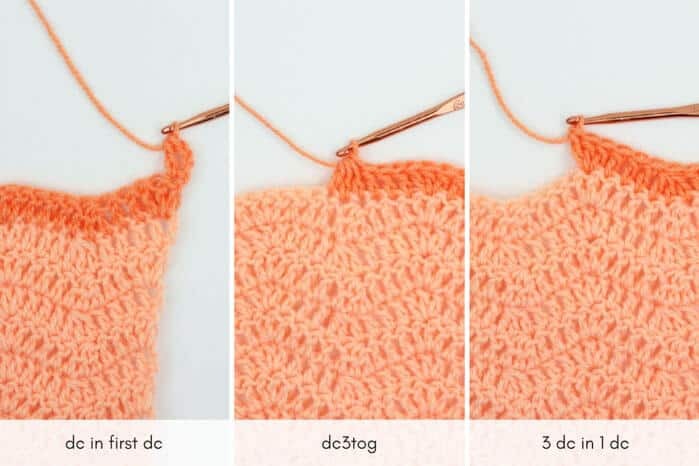 Pattern is worked in multiples of 10 stitches + 1, plus 3 for the foundation chain. For example, the pattern as written is (10 x 12) = 120 ch, plus 1, which equals 121, plus three for the foundation chain for a total of 124 chains to begin. A larger blanket might be something like (10 x 20) = 200 ch, plus 1, which equals 201, plus three for the foundation chain for a total of 204 chains to begin. 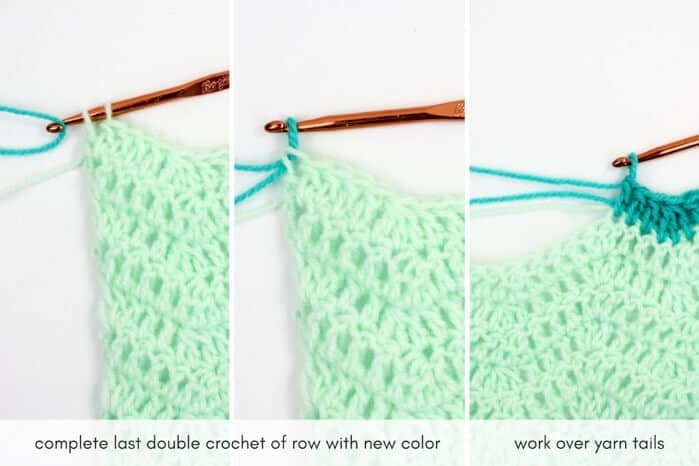 Foundation Row: Using Color A, ch 124. Row 1: Skip first 3 ch (counts as 1 dc), 1 dc in fourth ch, *1 dc in each of next 3 ch, dc3tog over next 3 ch, 1 dc in each of next 3 ch**, 3 dc in next ch; repeat from * to end of row, ending last repeat at **, 2 dc in last ch; turn. Row 2: Ch 3 (counts as 1 dc), 1 dc in first dc, *1 dc in each of next 3 dc, dc3tog over next 3 dc, 1 dc in each of next 3 dc, 3 dc in next dc; repeat from * ending last repeat with 2 dc in tch; turn. Rows 61-72: Using Color F, repeat Row 2. Here are a few more free crochet patterns for children from Make & Do Crew that you might enjoy! 1. 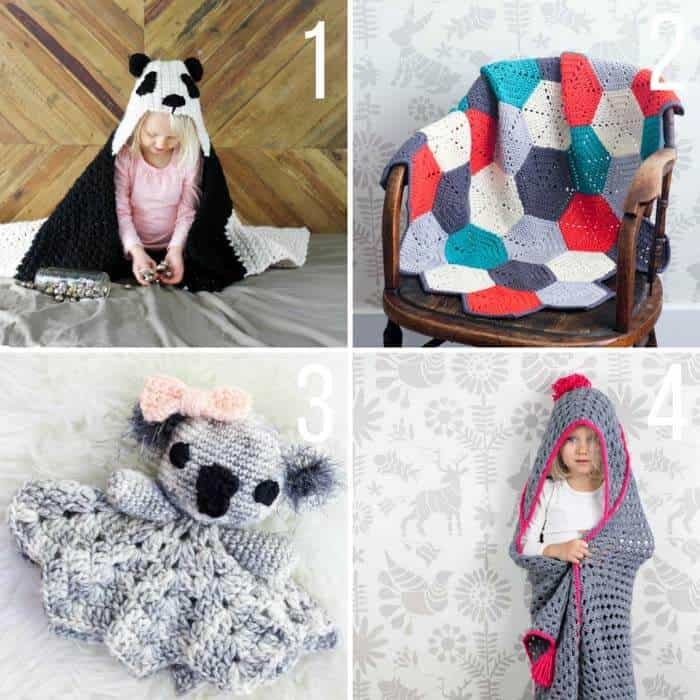 Panda Hooded Crochet Blanket Pattern – free pattern! 2. 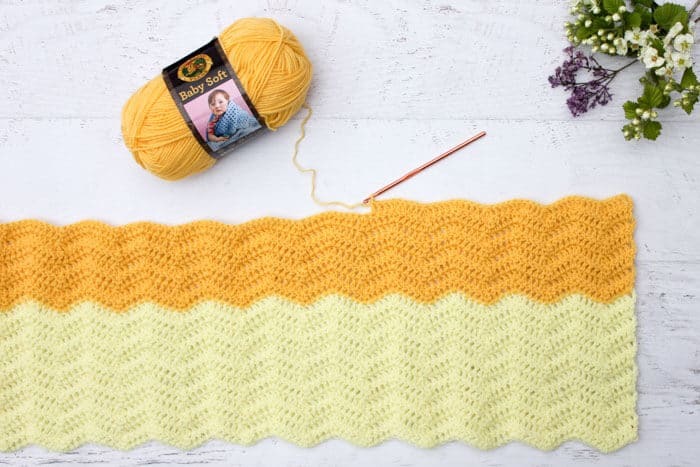 “Happy Hexagons” Crochet Baby Blanket Pattern – free pattern! 3. Cuddly Koala Lovey – free pattern! 4. 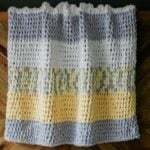 “Granny Gives Back” Hooded Blanket – free pattern! 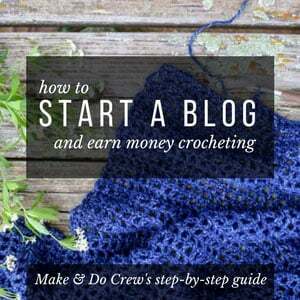 « 24+ Popular Spring and Summer Crochet Patterns – All Free! You should have your patterns in PDF so I can download then. You can purchase the ad-free, printable PDF of this pattern for $2.50 here. 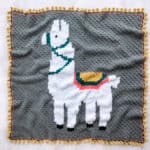 With the free patterns on the blog, I earn money through displaying ads, so with the ad-free PDFs, I charge a small fee. Hello Jess, I love all your work and this actually has been keeping me busy since I lost my job months ago. I am a Nigerian and want to purchase the ad for this blanket and some baby slippers u posted on face book. I can’t pay on dollar because there is a regulation on ground that doesn’t help foreign exchange. So how do I go about it can I pay in Naira? nice patterns you send me crochet bag and pouch pattern. Hi Jess – I keep seeing references to a tutorial for this project. Is that a reference to a particular video? If not, do you have related videos that can help me with this project as someone brand-new to crochet? Thank you! Welcome to the wonderful world of crochet! The tutorial for this one is a photo tutorial, which should give you a pretty good idea of how to work the pattern. If you’re looking for a video though, I linked to a video in an earlier comment up above that is a similar pattern and should give you a pretty decent idea of how to work this pattern. I hope that’s helpful! Thank you very much fır the lovely Pattern. I love the colors, so beautiful. Thanks Ezgi! I really loved working with these colors too. They’re just so happy and cheerful! Thanks for the pattern. I’ve just finished it, though sadly not in colours as lovely as yours! Really pleased with it. I’ve wanted to make one with a chevron for ages but couldn’t follow the other patterns I’ve seen. This was really easy to read. Thanks!